Posted in Dental Health on March 28, 2013. Last modified on March 28, 2019. Read disclaimer. These days, it seems like what's NOT included in foods and cosmetics is nearly as important as what IS included. Items boast of being sugar-free or fat-free; containing no artificial preservatives or coloring; coming from animals that have been tested to be free of growth hormones and even packaged in BPA-free containers. Granted, too much of any of those substances may be bad for our health but why do so many toothpastes tout the fact that they are "fluoride-free?" (See "Should I be using Fluoride-Free Toothpaste?") And why are some people concerned when fluoride is added to a community's drinking water? After all, fluoride has been proven to reduce tooth decay and the Centers for Disease control calls the US water fluoridation program "one of the 10 great public health achievements of the 20th century." How far have we come in terms of dental health over the past century? Prior to the common use of fluoride products, extraction was about the only solution for tooth decay. In fact, one of the leading causes for rejection by the US military in World Wars I and II was if the person was lacking six opposing teeth, in order to chew with. Then, in 1901, a dentist in Colorado Springs, CO noticed that many of his patients showed signs of what is now known as dental fluorosis (mottled, discolored or even corroded tooth enamel due, to consumption of high levels of fluoride as children before 8 years of age). Coincidentally, he also noted fewer cavities in his patients than what other communities were reporting. A few years later, a dentist in Bauxite, Arkansas noted a similar increase in dental fluorosis -- but this time it occurred shortly after a new well was dug. This created the suspicion that "there must be something in the water." Finally, in 1930, a test of that well revealed that it contained naturally occurring fluoride at more than 13 times that of most other wells. The water in Colorado Springs was soon tested and found to also be extremely high in fluoride. Shortly thereafter, a link was established between high fluoride levels in drinking water and a lower rate of dental cavities. By 1945, communities that implemented water fluoridation programs saw a 50-70% decrease in dental cavities and toothpastes containing fluoride began appearing in the late 1950s. pose no health threat (other than, perhaps, to infants under age of 2 whose formulas are reconstituted exclusively with fluoridated water). Community water fluoridation programs have been supported by each of the past five US Surgeons General. 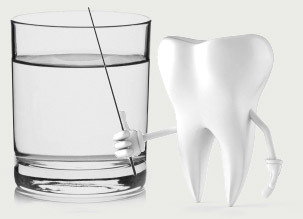 have been shown to reduce tooth decay by 20-40% because fluoride acts like a vitamin or medicine for your teeth. It not only helps to protect against demineralization of tooth enamel by acidic foods and drinks, it can actually remineralize teeth as well as disrupt the bacteria that produce tartar-forming plaque. may be the simplest and most cost effective means of preventing tooth decay. Communities save an average of $38 in dental bills for every dollar spent on water fluoridation programs. is a lower level of fluoride than what naturally occurs in many groundwater sources. is supported by science-based research and reviews. Furthermore, fluoride can not be taken into the body through the skin, so there is no concern about absorbing fluoride while taking showers, baths or swimming. Above 0.7 mg/liter, the CDC has determined that dental health benefits are negligible but the risk of fluorosis in children increases. And at even higher levels over long periods, bone problems in adults and possible kidney damage become a concern. Unfortunately, the US EPA requires only that communities stay below 4.0 mg/L -- citing the cost of maintaining lower levels as one of their considerations. Some research suggests that the ability of fluoride to prevent and reverse early stages of tooth decay comes primarily from topical contact rather than ingestion. Some argue that the form of fluoride used in municipal drinking is inferior to that used in dental care products, but rather is a direct byproduct of agricultural chemical production. Mother's milk is extremely low in fluoride, which could indicate that babies should not be consuming fluoride, especially at the levels found in fluoridated water. And, even if mothers are aware of the CDC's recommendation that infants should not be consuming formulas that's exclusively rehydrated with fluoridated water, these families may not have access to fluoride-free water. Freedom of choice is being taken away from us; there is a chance that the experts are making a mistake yet their decision to fluoridate drinking water is being forced on the entire community. If one prefers to not drink fluoridated municipal water, it is not possible to remove fluoride by boiling or freezing the water. Only a water-distillation system (where water is boiled and the vapors are captured) and some reverse osmosis systems are effective at removing fluoride. Curious as to the fluoride level in your community's drinking water? Visit the CDC's consumer resource page, My Water's Fluoride? Are you drinking fluoridated water at your home, school or office? If so, how do you feel about it? We'd love to hear your thoughts on the subject. Please leave them in the Comments section below. You may also be interested in: - Are fluoride toothpastes safe?